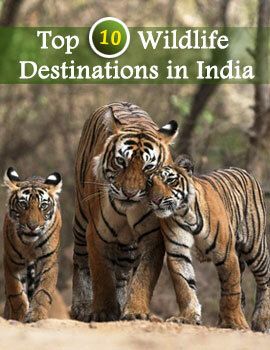 Tiger Land Resort is situated near the Kisli Gate of the Kanha National Park. Spread over 5 acres of lush greenery, the resort is well hidden from the main road to ensure privacy and serenity. Tiger Land Resort has accommodation blocks with two-room cottages. There is also a block that has 4 rooms. Each room is spacious, has an attached bathroom, and has large windows for an unobstructed view of the forests. Tiger Land Resort has a multi-cuisine restaurant decorated in ethnic style with a fireplace in the corner. You can dine on Indian, Tandoori and Continental cuisine. Campfires with barbecues are also arranged for the guests in the evenings. Duing your stay at Tiger Land Wildlife Resort, Kanha you can explore the greenery around the resort or go on jungle safaris to Kanha National Park. The nearest town to Tiger Land Resort is Mandla. The nearest airport and railway station are at Jabalpur. The park is entered from either Khatia-Kisli or Mukki. Frequent state transport buses ply between Jabalpur and Kanha National Park.